Excitedly walking through downtown Philadelphia’s “First Friday” gallery crawl this past weekend, I stumbled upon an exhibit of dedicated and extremely gifted artists showing at The Center for Art in Wood. This exhibition celebrates the Center’s seventeenth year of hosting the International Turning Exchange Residency (ITE) program; seven artists/scholars travel to Philadelphia to create new work, visit nearby cities and research for two months, developing new directions and even discover new materials for their work. Jeannette Rein (Perth, Western Australia) creates stunning assemblages using materials as diverse as bleached and steamed wood, milk paints and glass. Jeannette Rein and Lindsay Gilbert (glasswork): “Sea Shard”. 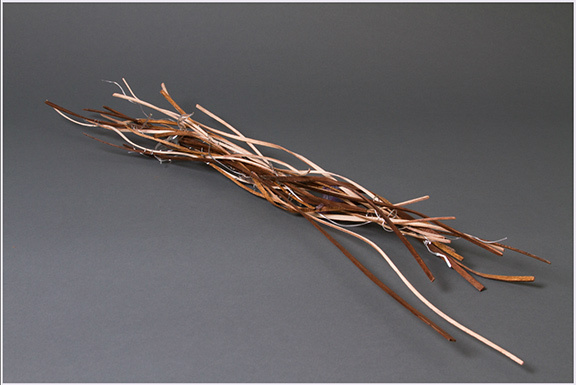 Steam-bent black walnut, blown glass, glass rods, aluminum wire, 4 1/2″ x 9″ x 41″, 2012. Sea Shard represents a new grouping of chosen materials for Rein, as this piece is the product of collaboration with Philadelphia-based glass artist, Lindsay Gilbert. Rein is masterful in weaving the walnut wood and metal wire into undulating curves with Gilbert’s glass elements. 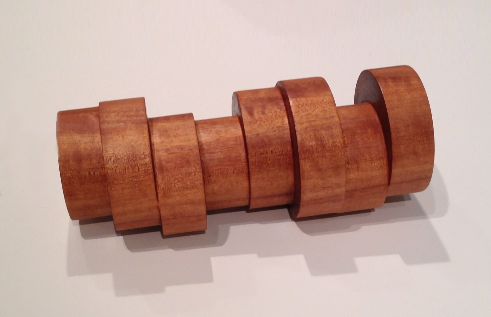 Rein transposes her wood materials into that of a fiber or threaded vessel, creating the illusion that this item may have been “found” instead of meticulously crafted, perhaps wrapped around a shipwreck; or has become arranged into this pattern of interwoven “fibers” somehow on its own through the forces of nature at sea. allTURNatives: Form + Spirit 2012 – International Turning Exchange Exhibition can be viewed through October 20th, 2012 at The Center for Art in Wood located at 141 N. 3rd Street in downtown Old City, Philadelphia, PA. Except where noted, images are courtesy of The Center for Art in Wood, Philadelphia. What an interesting perspective, Gina! The “Shipwreck!” exhibit at the Philadelphia Museum looks fantastic – I hope to get there to view it sometime soon. Thank you so much for your insightful comments and visit! Dawn, I can’t think of anyone more qualified than you to apply for a residency here. I know exactly how you feel, likewise – I would love to show my metals’ work in Australia. Hopefully, both will happen for us!